It’s not everyday that I find a letter by a Civil War general, specifically answering the question “which was your favorite horse?” But today, we got lucky! 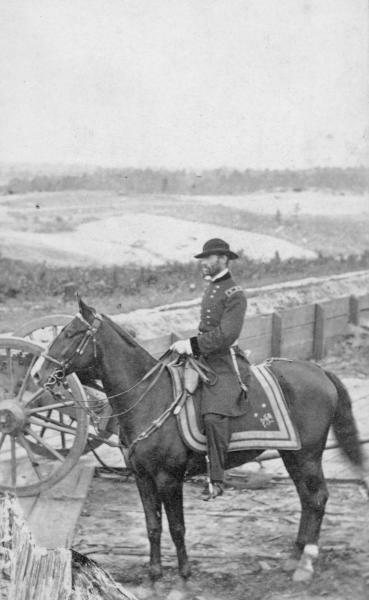 Matter-of-fact Union General William T. Sherman clearly stated in 1888 which warhorse was his favorite. Meet the horse that entered Atlanta and probably took the general on the March To The Sea: Duke. Sam – one of the several Sherman horses wounded at the Battle of Shiloh in April 1862. This horse was described as “always hungry…never lame.” Sam recovered from the Shiloh wound, and some sources say he was Sherman’s second favorite horse. Lexington – this horse is sometimes mistakenly identified as the famous racehorse who also had the same name. After checking some articles about the racehorse, it seems unlikely that famous horse got near a battlefield. However, Sherman’s Lexington may have been the general’s mount at the Grand Review in Washington in 1865. General Sherman recorded a little about Duke’s appearance, saying he was a “bright bay” color, with a star or some sort of face marking (see photo), and one white sock on a hind leg. From photographs and paintings, we see a fine looking animal, appearing ready to carry a general on a relentless march through the South. 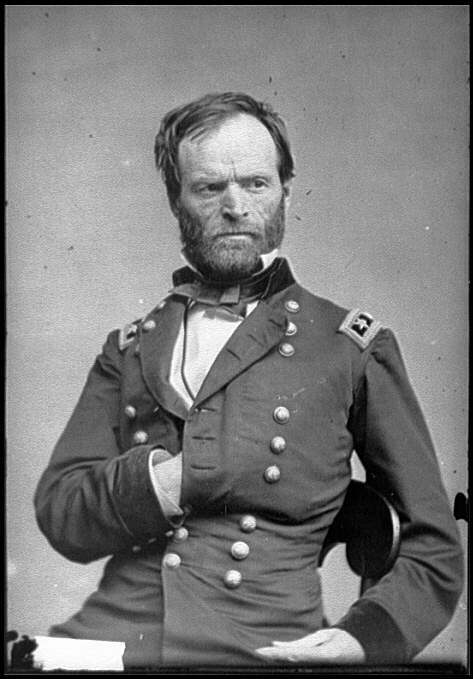 General Sherman was a nervous and somewhat careless rider. He wore his stirrup-leathers very long, seeming to be almost all the time standing in the irons. This appearance was intensified by his habit of rising in the stirrups on reaching a turn in the road or some advantageous point of observation. While always careful of his animals, Sherman did not appear to have that fondness for them that is so common among good horsemen. He was constantly on the go, and his eye seemed to be everywhere except where his horse was treading. Sherman’s rein was a rather loose one, for he trusted apparently, the natural sagacity of his steed, rather than to his own guidance. Seen at the head of a column of troops, or giving orders for their disposition on the field, Sherman presented a remarkable figure. Riding along the road, he was constantly gazing about him, noting the lay of the land passed over, as if internally planning how a battle could be fought there. In 1888, an artist wrote to Sherman, asking some questions for artwork authenticity. Sherman’s reply gives some insights to his favorite horse. You can view a copy of the original letter here. I take pleasure in saying that my favorite horse during the war was the one I rode at Atlanta, and whose name was “Duke.” He was a bright bay, had a white star on forehead, and one white foot (left hind foot). I have a good portrait of him by Trotter of Philadelphia now hanging in my office. We changed horses so often that it is impossible to say more. Grant had several one of which was “Cincinatus,” a horse well remembered by many, & was a great favorite. It’s not completely clear from the sources I found. However, it seems safe to assume that Duke survived the war, since Artist N.H. Trotter painted his portrait. After the war, Sherman oversaw the Military Division of the Mississippi (basically from the Mississippi River to the Rocky Mountains) and in 1869 was promoted to Commanding General of the United States Army. It seems possible that Duke may have stayed in the general’s stable. 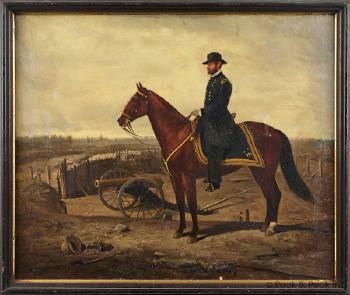 When Sherman retired in 1884, he admitted that he didn’t ride much anymore, but he might have thought about his favorite horse every time he went in his office room at home and saw the portrait of magnificent Duke, every-ready in the painting to press to the end of the war and find green pastures to call home.